Wittle Birdie died peacefully in Oakville on 31 July 2015 at the age of ~2 weeks. Wittle Birdie is survived by his/her parents, Daddy and Mommy Birdie. He/she is preceded in death by all his/her brother and sister birdies. 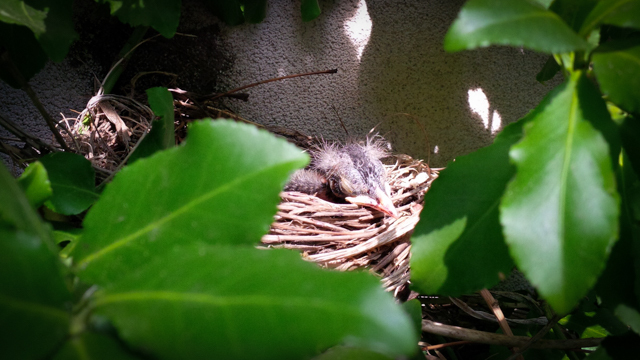 Wittle Birdie was born on ~15 July 2015 in Oakville. He/she never graduated from the nest, never had a sweetheart, and never had a chance to set up his/her own nest. Wittle Birdie was not afraid to take risks, and couldn’t wait to be able to fly. In accordance with his/her wishes, no funeral is scheduled. Condolences can be left in the comments below. Condolences to our family ornithologist. Take heart,spring will come again. there will be more nests,more twittering in the trees and your back yard sanctuary will be a place of much pleasure again. Amy B.